Introducing the Black Widow! 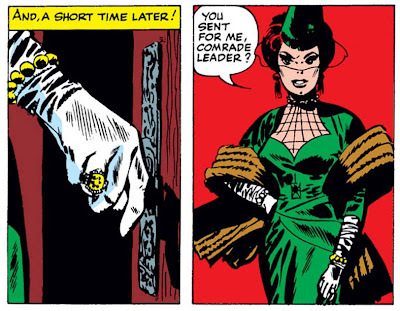 Yes, in this issue Marvel's premiere Russian super spy makes her debut, if in a rather understated form. Not yet a costumed action hero, here she appears as the quintessential femme fatale going by the name "Madame Natasha". It's hard to believe that the woman in this bit part would go on to become not just a major character, but an on-again off-again member of the Avengers - eventually becoming such a significant part of Marvel canon as to appear in the feature film Iron Man 2, as well as the upcoming film version of The Avengers. But then, perhaps Stan knew the character had boundless potential from the start; after all, this tale ends with notice that the Widow would return the following ish...! It's amazing how the right outfit can make a girl forget she has no nose! 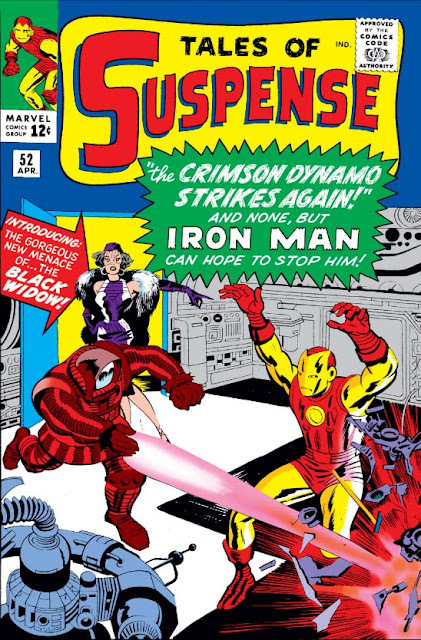 Speaking of returns, this issue sees the second appearance of the Crimson Dynamo, last seen in Tales of Suspense #46. 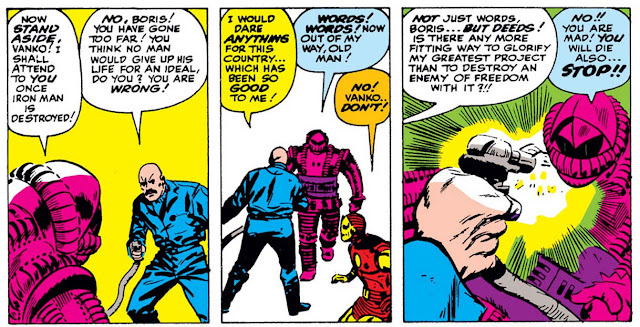 But how, we ask, can Professor Vanko be menacing Iron Man on the cover once again? After all, at the end of that last outing he renounced Communism and defected to the US, swearing allegiance to his newly-chosen home. 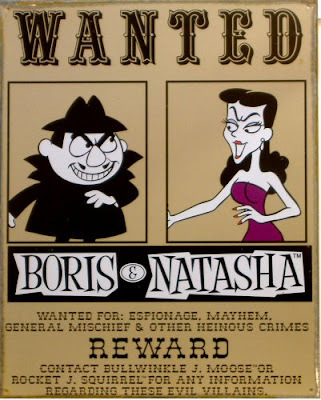 Well, as it turns out, the Soviets generally frowned on that sort of thing - so they send in the Black Widow and another agent, Boris, to eliminate Vanko, his employer Tony Stark, and Stark's bodyguard Iron Man. So the pair fly off to America, where they-- Wait a minute. Boris? And Natasha? Wow. You certainly can't accuse Stan of taking his material too seriously for the occasional joke! It's a very different Vanko we see than the one who originally crept to our shores. Surprisingly, this turns out to be a rather touching story, and it all comes down to Vanko. It would have been easy for Stan to gloss over the ex-villain's defection and portray him as nothing more than a regular scientist guy. But not so: Having "seen the light" about the treacheries of Communism, he is now, months later, shown to still be tearfully grateful to America (and Tony Stark) for giving him a second chance and a new life, and is committed to doing whatever he can to repay these gifts. With less care, such naked sincerity could seem mawkish or dull, but under Stan's pen - aided by the genuine expressions that Don Heck's linework evokes - we believe him, and care for him. When Vanko, at the climax of the story, vanquishes the enemy agent Boris (who had donned the Crimson Dynamo armor himself) even though it means giving up his own life, the sacrifice rings true. But even though it would take a few years, the threat of the Crimson Dynamo would return...! Meanwhile, this issue's "Tales of the Watcher" tells the story of an Earth in the 23rd century, a world finally without war but whose populace are now consumed with goals of greed and ambition. But noting the era cited, and having read this issue on the heels of the previous one, a thought occurs: Could this backup tale be conceivably set in the same world as the last, some two hundred years later? I know, I know; despite the continuing framing device of the Watcher, they're clearly unconnected vignettes not meant to be tied together. But, as a small game for ourselves, could they be? Amusingly enough, as far as these two tales go, the answer appears to be "yes!" After all, our contrast to the protagonist last time around was the brother who owned a thriving hovercar business and mocked his sibling for his idealistic dreams; it's not hard to see that kind of figure as the beginning of the societal trend portrayed here. And the aliens who come to Earth at the end of this tale seem to be humanity's first contact - which also matches up with the 21st century story of humanity unable to discover any other intelligent life in the cosmos. Granted, these tales would at the very least have to occur in some alternate reality that the Watcher's peeking in on (foreshadows of What If...?, perhaps? ), as in the burgeoning Marvel U alien spacecrafts seem to drop from the sky every Monday morning. Which begs the question: Was Tony Stark the moose or the squirrel?